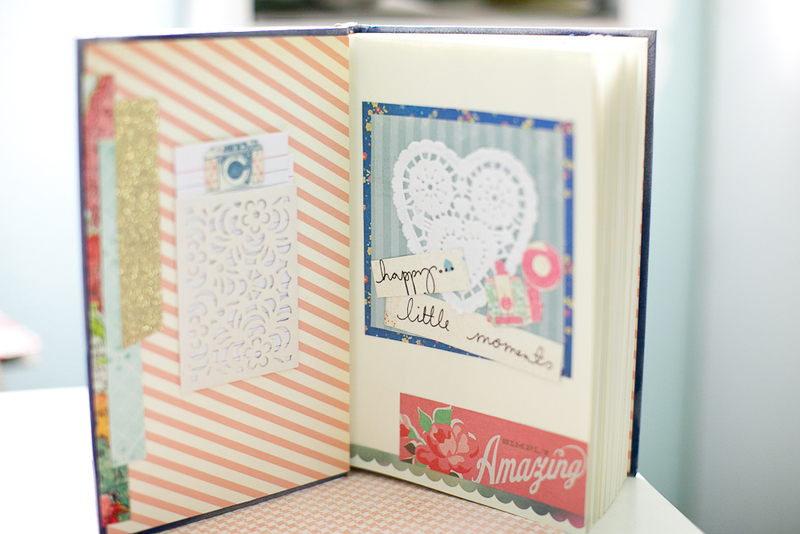 My Happy Little Moments Book! Hi! So I have a lot of new stuff to post. I thought I would start with talking about a new class I am taking right now called More Happy Little Moments at Studio Calico with Maggie Smith and Marcy Penner and Lisa Truesdell as the teachers...its awesome!!! I am having so much fun and I just wanted to show a few shots of some of the work I've done. I will take more pictures soon so you can see some more of my book. If you would like to see some of the awesome stuff that others who are taking the class have down with their books, check out the gallery at http://www.studiocalico.com/ and if you ever want to take a class at Studio Calico, I highly recomend it! So far I am so inspired and am learning cool new stuff and having so much fun! I am in love with this project! It's my first altered book and my first online scrap class! So this is my cover. I really love the way it turned out! I used Basic Grey's Mint Julep collection and Crate Paper Fourteen and a heart doily and some scraps from October Afternoon and some American Crafts glitter tape on the side. I spray painted the cover of the book silver (actually my hubby did that for me in the garage...he's so sweet...so nice to help me!) Maggie Holmes spray painted her cover gold and I was inspired to spray paint mine too! I really liked the idea of doing mine silver though, but also wanted a touch gold so I put the glitter tape along the side. I really love the little deer from the Mint Julep collection! She is so cute and just makes me happy! 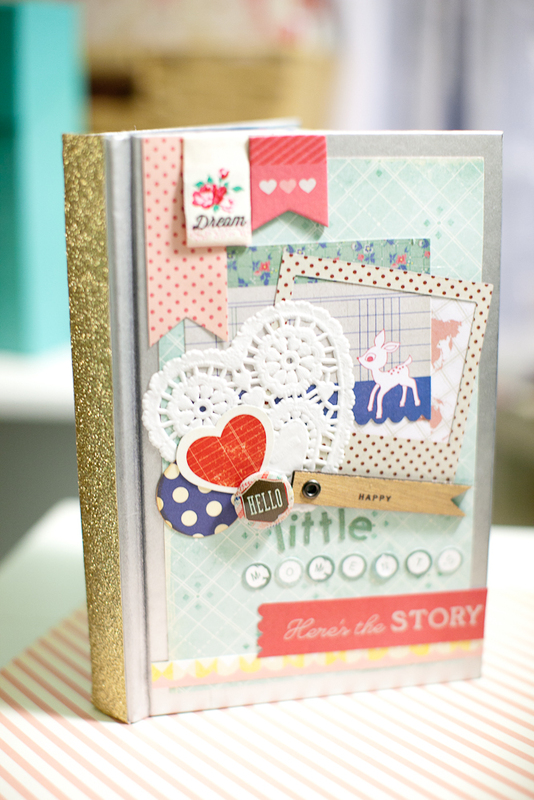 I used polaroid that I cut out using a scrap of polka dot paper and some square die cut doodads from Spellbinders. I also used a Prima wood flag that says happy along with some Basic Grey letters for the title. I hope you like it! (note: I used the American Craft's "brown sugar" glitter tape which as you can see in the pictures is actually a true gold as opposed to their "gold" glitter tape which looks much more bright glittery neon yellow to me). And I also wanted to show the beginning of my book. I really liked the idea of lining the front and back inside cover with striped paper to make it look like a classic book but also wanted to add a bit of handmade craftiness to it so I cut some strips of patterned paper to look like washi tape along the side, along with some more of that brown sugar/gold glitter tape. And I wanted to put a little envelope on the inside cover to make it look like a library pocket but a more prettied up version so I took a Basic Grey laser cut mini envelope, turned it on its side and cut a slit at the top to make a pocket. I then cut an index card to fit in it and glued a lil Maggie Holmes camera to the top of the card. 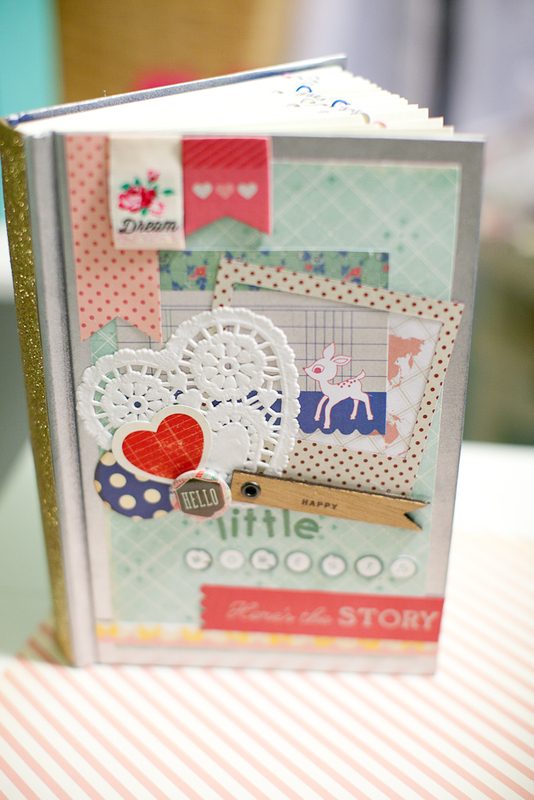 On the cover page I wanted the page to reflect what was on the cover of the book a little so I used another heart doily. 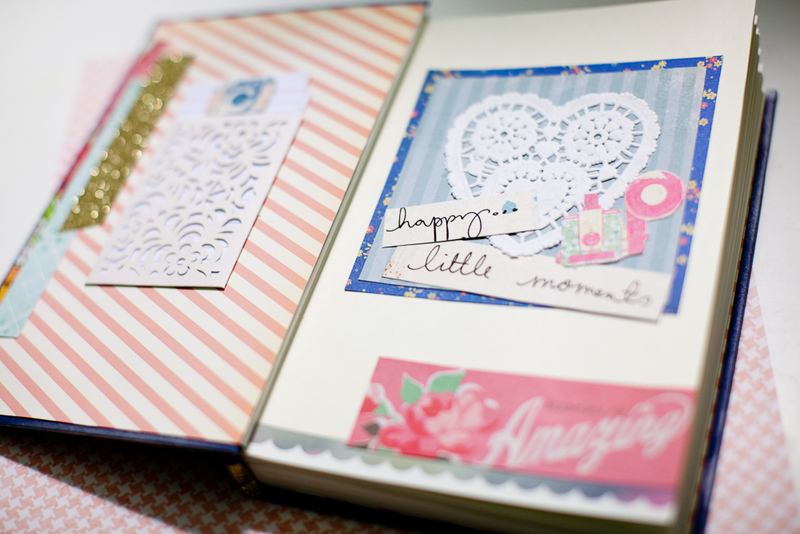 I also used Maggie Holmes' pattern paper with all the writing on it and cut out the happy and little moments to make the titile "Happy Little Moments". And I cut out another little camera from the camera patterned paper in her collection and then added one of her border strips and a little peice from Basic Grey Mint Julep at the bottom. As well as some old My Minds Eye turquoise scrap paper and some new Mint Julep blue floral paper to frame the heart on this title page. What do you think? as well as going to Studio Calico's website. Oh and I think there may still be some of Marcy's class kit left so even if you missed enrolling for the class, you can get the kit and do something similar! Yay!